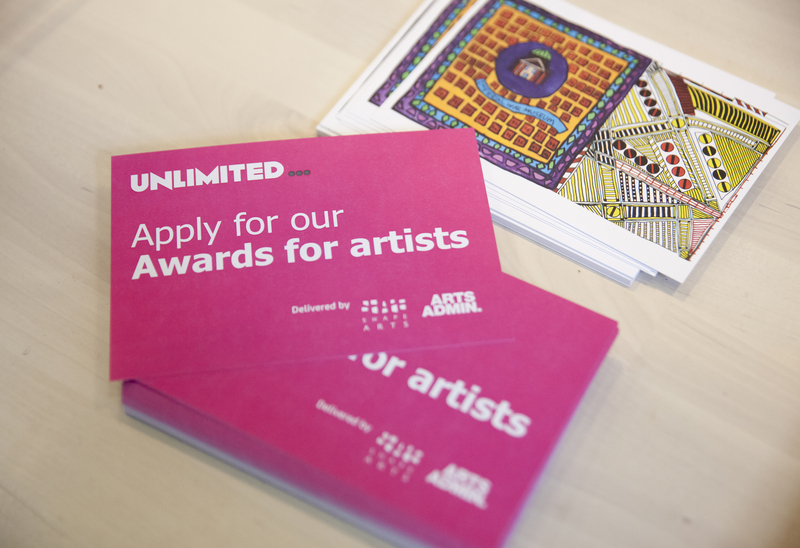 The deadline to submit an Expression of Interest for funding from Unlimited is looming (it’s 29 October at noon), and we know many people love to make last minute applications. We’ve gathered a few of the top queries – and their answers – to ensure you have all the information you need to make the best application you can. How do I know which strand to apply to? If you are an emerging artist based anywhere in the UK, then you can apply for the Emerging Artists Awards. We define an emerging artist as someone who has yet to receive major exhibition or showcasing opportunities. You can read more on what we mean by emerging on our blog. If you are an established artist, based in England or Wales, you can apply for either a Main Commission or Main Research and Development Award (or both!). Which one? That depends how developed your thinking is for your idea. Do you have a clear vision of the process you’d take to create a new piece, the outcome you expect to have and the context the work could be shown in? Then apply for a Main Commission award, and if successful you’ll get significant funding for your project from the start in 2019 to full presentation and touring or sharing the work widely in 2020. Do you want to explore a new idea, perhaps delving into art processes or partnerships that are new for you, and which is at too early a stage to commit to the specific form or outcome of a new piece of work? Then apply for a Main Research & Development award. If successful you’ll receive support towards this initial exploration without having to commit to sharing the work with the general public. Main R&D and Main Commissions Partnership Awards: what’s different about them? Our new Partnership Awards are embedded in the Main Award They’re an opportunity to extend your work in partnership with another organisation. This might have a number of benefits for your project: a partner to support the development, a context to trial out the work, a network to invest in the future of the project. If the specific partner doesn’t feel your application is right for them, it still stays in the mix to be considered for a Main Award anyway – you’re not reducing your chances of getting funding by applying to the partnership awards. Read more about them on a recent blog post. And if you apply for one, you can also make another application – see below. Can I apply if I receive benefits? Yes. We work with each awarded artist to identify how best to ensure the management of their grant, the number of hours worked, the payments made and in particular cases, we help to ensure this does not impact upon artists benefits, if that is what the artist wishes. If you are an emerging artist, no. You can only be lead artist for one application, and be mentioned in up to two others. If you are an established artist, you can be the lead artist on two applications, provided that at least one of them is for a Partnership Award. This can be either for a Main Commission or a Main R&D. You can also be mentioned in up to two other applications. Can I submit in a different format? Absolutely. While our principle way of accepting applications is via our online portal, we know this is not accessible to everyone. If you have any questions on arranging for access support or submitting your application other than via our portal, please contact sara@shapearts.org.uk as soon as you can ahead of the deadline. More questions? Read our Frequently Asked Questions, and get in touch with us if you’re unsure of something. Best of luck!